We're proud to welcome Qmusic to the Zender customer family, as Q launches Qwistet: the very first live trivia quiz on mobile in Flanders. A live online video quiz on mobile that’s free to play via the Q-app. 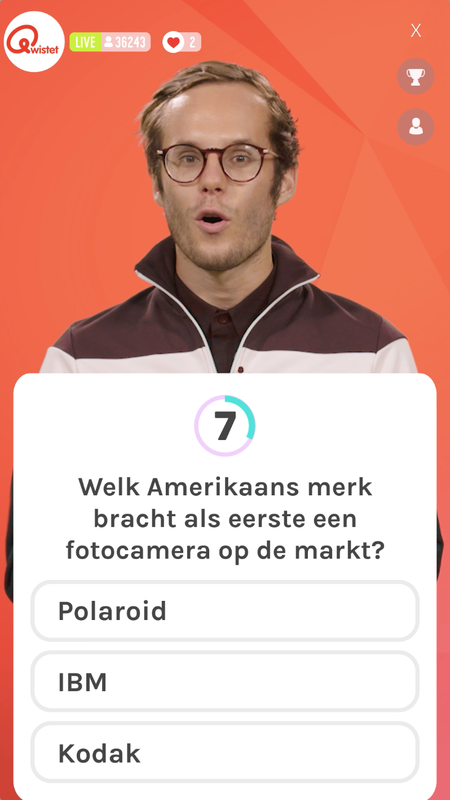 That is Qwistet: the first trivia quiz of it’s kind in Belgium, launched by Qmusic, the biggest commercial radio station in Flanders. The concept is simple: host and Qmusic dj Vincent Fierens has 500 euro to give away every day, and asks 10 multiple choice questions. The prize money is split among all the winners who correctly answered all 10 questions. Everybody who wants to have a shot at winning, can log in to the Q-app on smartphone or tablet to play the quiz, every weekday at 12:30pm, from the end of October. Host Vincent asks 10 multiple choice questions about topics like current affairs, movies, television and sports, adding a lot of interaction with the contestants. All players can interact with each other and with Vincent in a group chat. The trivia quiz itself is an elimination game where the contestants get 10 seconds to answer a question. Players who get the answer right within that time, go through to the next question. Get a question wrong, and you’re out - but you can still watch the rest of the show. To build Qwistet, Q partnered with Audience Engagement platform Zender.